"This is a macaroni and cheese I first made 3 years ago when I was in California. When I got back to Texas I made it for my mom. This is now her favorite baked macaroni and cheese. She begs me to make it when I come to visit." Melt butter in a medium saucepan over medium heat. Saute onion for 2 minutes. Stir in flour and cook 1 minute, stirring constantly. Stir in milk, salt, mustard and pepper; cook, stirring frequently, until mixture boils and thickens. To the milk mixture add the Cheddar and American cheeses; stir until cheese melts. 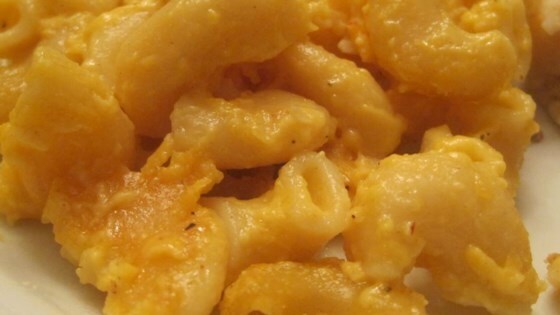 Combine macaroni and cheese sauce in a 2 quart baking dish; mix well. This creamy baked comfort food classic has two kinds of cheese.